Underground is Georgia State University’s very own undergraduate literary journal. Our staff consists entirely of undergraduate students who attend the university’s Atlanta campus. We publish an issue of poetry, prose, and art once every semester. We love (and want) work that is experimental, daring, and a little bit weird. If that sounds like you, then consider submitting your work to us! We accept submissions from all undergraduate students currently enrolled in an accredited university or college. Please see our “Submissions” page for details on our submission process and reading periods. Grace Aldis is a senior English major. She has been dedicated to all things reading and writing since she was young. Grace enjoys long walks in parking lots, listening to bad music, and watching pigeons do their stuff. She’s also a huge history nerd and loves dragging her friends to art museums and old cathedrals. She was honored to work as the poetry editor for Underground last year, and she’s even more excited to lead the journal this year! Rebecca Bates is a junior who is currently pursuing a Studio Art major with a concentration in Graphic Design. She’s been enthralled with art ever since she can remember, experimenting with all forms artistic expression that she can–including dabbling in creative writing. She loves to gather inspiration from various places, whether it be other artists, film, or cartoons because she’s a huge nerd like that. One day, Rebecca will actually finish one of her numerous self-inflicted projects. 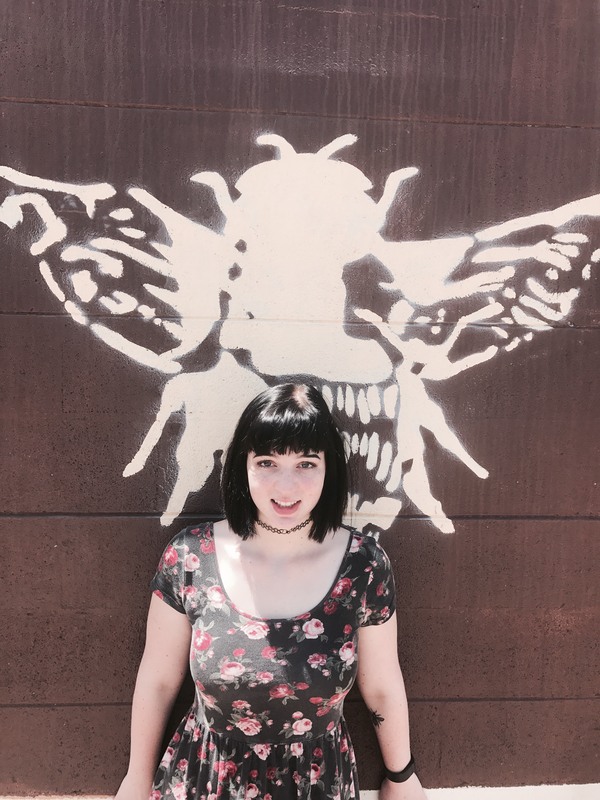 Alice Benson is a Sophomore English major with a concentration in creative writing. Among her many interests are late-night walks to the nearest Waffle House, quaint thrift stores, and X-Files reruns. She hopes to either pursue a career in fiction or become a translator for American Sign Language. In all her endeavors, she would like to send a special thanks to her loving boyfriend, the Mothman. Cayce is a junior studying film and music as well as a former contributor of poetry to Underground. In a past life she attended GPC with a focus in the (often misguided) study of business. She has been in and out of college for almost a decade and enjoys the perspective that stems from a younger class setting. She looks forward to continuing her education and teaching after being inspired by a handful of fearless female professors here at GSU. When she isn’t studying, her free time is spent amplifying civil and human rights, challenging the patriarchy, engaging mental health and recovery support in the community, and caring for two incredibly goofy looking dogs. She dedicates this bio and any legacy she may leave behind at GSU to her late dog, Phoebe. Cemberli is a junior English major with a minor in women’s and gender and sexuality studies. Her passions include writing, exploring many different forms of art and traveling. She hopes to find a career path that embraces all three. In the future, after she becomes a novelist she would like to teach literary studies courses at the university level. Zach Salling is a senior neuroscience and English major. He’s a journalist for The Signal, interests including science/medical communications, and writes fiction. He aspires to practice Neurology, focusing on Geriatrics, and publish fiction/non-fiction. He stresses collaboration among the humanities and medical field for more ethical, quality practice and for more diverse, representative literature. When not at school or slinging drinks behind a bar, you will most likely find Zach injuring his neck/pride in a mosh-pit or watching The Bachelorette (#TeamRachel) at your local dive-bar with a book.